After weeks of waiting, the final Removable Blocks is here! 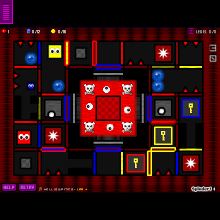 Extend Instructions: LEVEL 30| There is boss battle at last level, Boss' bullets can cross through obstacles and hazards. And there's no safe areas. To defeat the boss, push the blue balls to gray near the boss. White once can cross only blue ball, it won't lose once it touch to hazards. This would be a tough game.